I was surprised to learn that Charlie Chaplin, one of the great stars of silent cinema, made only three feature films in the 1920s; sandwiched between The Kid in '21 and The Circus in '28 was The Gold Rush, a 1925 comedy in which Chaplin’s iconic Little Tramp became the “Lone Prospector”. 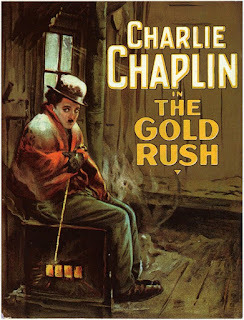 The story is fairly straightforward: After hearing that gold has been discovered in the Klondike, a Lone Prospector (Chaplin) journeys to the snowy region, intent on becoming a very rich man. Along the way, he meets a variety of characters, including Big Jim McKay (Mack Swain), who becomes his partner; the villainous Black Larsen (Tom Murray); and the beautiful Georgia (Georgia Hale), who captures his heart. Through many trials and tribulations, the Prospector presses on, convinced there’s gold just waiting to be found in this Yukon wilderness. But will he find any before he starves to death? The Gold Rush features a number of now-iconic scenes, like the one where Chaplin’s prospector is so hungry that he eats his own boot (the sight of Chaplin twirling the shoelaces around a fork as if they were spaghetti is priceless). Just as memorable are the “dinner roll dance” (where the prospector, using two forks with dinner rolls at the end of them, gleefully “dances” around the table) and a scene in which a cabin teeters dangerously on the edge of a cliff. Chaplin’s pantomime skills also get a workout (like in the sequence where he’s trying to leave his cabin, yet is constantly pushed back inside by the harsh wind), and there’s some heartbreaking drama as well, in the Prospector’s relationship with Georgia. In short, The Gold Rush has it all! Despite the fact his output in the ‘20s was limited; all three of the films Charlie Chaplin produced in that decade are now considered classics, with The Gold Rush leading the pack. Finding something to laugh about even in the most difficult conditions, The Gold Rush is one of the great movies of the silent age.